Tianma America has introduced a narrow-frame / wide-format 11.3-inch LCD (888 x 408) that is ideal for gaming applications. Photo: Tianma America, Inc.
Chino, CA, June 26, 2017 -- Tianma America, Inc. has announced the introduction of a wide-format 11.3-inch LCD (888 x 408) with a narrow frame. The new product not only has a distinctive module size of 271.8 mm width x 133.0 mm height (aspect ratio of 37:17) but also adopts a narrow frame design with the narrowest side length being 2.3 mm. These dimensions enable the alignment of multiple displays side-by-side for stylish design in gaming applications and other “footprint sensitive” applications. The module was developed by Tianma Japan, Ltd., a Tianma Group company. 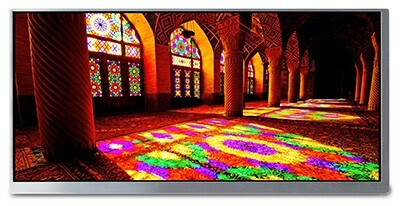 The new product utilizes high color rendering LEDs in the backlight assembly to guarantee wide color reproduction, achieving enhanced color reproduction of 88% of NTSC color space. This feature delivers great performance in applications that require more vivid and realistic images such as gaming. The new product uses Clockless Link™ (a proprietary interface standard developed by ROHM Co., Ltd.) for its interface. Clockless Link is a differential serial interface based on Clock Data Recovery, which can largely reduce the number of signal lines and connector pins. This helps to reduce cost and supports a more compact design in applications equipped with this module. The luminance of the display can be adjusted to four levels with a slide switch. In addition, the backlight luminance can be adjusted from 15% to 100% through software settings, enabling images to be displayed at a more optimal brightness level, depending upon the needs of the various operating environments and applications. The new product incorporates Tianma Japan’s proprietary SFT (Super Fine TFT) wide viewing angle technology. This technology provides ultra-wide viewing angles of 176 degrees horizontally and vertically and reduces color shift that may occur with changes in the viewing angle, ensuring clear images without visual stress in various operating environments. The new LCD module was showcased at Display Week 2017, May 23 to 25 in Los Angeles, California, USA. For more information, contact Tianma America, Inc., 13949 Central Ave., Chino, CA 91710. Tianma America is the leading provider of small to medium size display solutions to the Americas market utilizing advanced technologies from Tianma Microelectronics and Tianma Japan, Ltd., coupled with the manufacturing resources of the Tianma Group. Applications include smartphones, tablet PCs, industrial and medical instrumentation, wearables, home automation, household appliances, office equipment, and automotive and rear seat entertainment devices, as well as test and measurement systems, instrumentation equipment, point-of-sale and ATM systems, gaming systems, global positioning systems, radio-frequency identification devices and barcode scanners. Technologies include TFT, LTPS, Oxide-TFT, AM-OLED, flexible, transparent, 3D, PCAP and In-cell/On-cell integrated touch. With a network of best-in-class distributors and value-added partners, Tianma America provides complete display module solutions for a broad base of customers and applications. The range of display features offered includes ultra-high resolutions, wide temperature ranges, high contrast ratios, rich color gamut, backward compatibility, LED backlights, high bright and transflective viewing for use in diverse lighting environments.